On Sunday, a MiG 27 aircraft of the Indian Air Force (IAF) crashed near Jodhpur in Rajasthan but the pilot ejected safely. 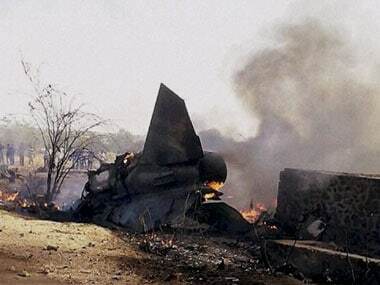 The fighter jet had taken off from the Utarlai airforce base but the jet experienced engine problems leading to the crash at around 11.45 am in Sirohi district around 120 kilometres south of Jodhpur. A court of inquiry was ordered to investigate the cause of the accident. However, preliminary reports indicate no loss of life and property on the ground. The jet was on a routine mission, reports said. However, this is not the first instance of an IAF aircraft crash in recent times. Here are earlier instances of such crashes, many of which turned out to be fatal for the pilots. An Advanced Hawk Jet (AJT) trainer had crashed on the Subarnarekha River bed along the Jharkhand and Odisha’s border with the pilot reportedly ejecting at the last minute to save his life. The incident took place on Subarnarekha River bed near Mahulatangili village under Jharpokharia Police Station limits of Odisha’s Mayurbhanj district. The impact of the accident was so severe that the jet was reduced to a mangle of metal and parts of the jet got buried under sand. The AJT had met with an accident after getting airborne from Kalaikunda on a routine training sortie. An Indian Air Force’s MiG-21 crashed near Nal in Rajasthan, however the pilot ejected safely. A court of inquiry was set up to investigate the cause of the accident. IAF spokesperson Group Captain Anupam Banerjee said initial inputs indicated the likely cause as bird hit after take off. A MiG 27 crashed near Jodhpur’s Banad area on September 4, 2018. On June 5, 2018, Air Commodore Sanjay Chauhan passed away after his Jaguar fighter plane went down in the Mundra taluk of the Kutch region in northwestern Gujarat. This was the second alarming incident in the month of June 2018 with an Indian Air Force Jaguar. A Sukhoi 30 MKI fighter jet has crashed near Nashik in Maharashtra on June 27, 2018. On June 8, 2018, Indian Air Force’s ‘Jaguar’ developed a snag while landing and had a minor accident. The pilot was on a routine training mission from the Jamnagar Air Force base. Six Air Force officers and a civilian were killed after IAF chopper Mi-17 crashed in Jammu and Kashmir’s Budgam on in the backdrop of heavy shelling and firing from across the border a day after IAF fighter jets crossed the Line of Control and destroyed a vast terror camp in Pakistan’s Balakot in a pre-dawn strike following the Pulwama terror attack. Latest reports have suggested that the investigation in the crash has hinted towards it being a casualty of friendly fire as air traffic control rooms and command centres were amidst intense pressure in the sequence of events leading to the India-Pakistan aerial dogfight on 27 February. Mi17V5 is one of the sturdiest choppers in service across the world and is not usually prone to technical faults of catastrophic nature. Designed to transport cargo inside the cabin and on an external sling, the Mi-17V5 is considered tone of the world’s most advanced military transport helicopters and ranks among the most technically advanced helicopters of the Mi-8/17 type, incorporating the best engineering solutions of previous generations. One Indian Air Force pilot died after two Hawk jet aircraft of the Surya Kiran aerobatics team collided mid-air in Bengaluru on 19 February, just days ahead of the biennial Aero India show. The Surya Kiran jets crashed while rehearsing for the air show at the Yelahanka Airbase in Bengaluru. Three pilots were on the two Surya Kiran Hawk jets that collided and crashed this morning. One pilot died in the crash while the other two managed to eject safely. A Mirage 2000 trainer aircraft, which was recently upgraded by the defence PSU Hindustan Aeronautics Limited (HAL), crashed soon after taking off at the HAL airport resulting in the deaths of Sqn Ldr Siddartha Negi and Sqn Ldr Samir Abrol, both test pilots with the Aircraft and Systems Testing Establishment (ASTE). A Jaguar fighter of the Indian Air Force crashed in the Kushinagar district Uttar Pradesh. Though, the pilot was able to eject safely in time using his tactical expertise to land the plane away from the habitation nearby. A court of enquiry was ordered to investigate the accident, the Defence PRO in Lucknow said. On October 5, 2018, an IAF microlight aircraft had crashed in Ranchad village of the Baghpat district of Uttar Pradesh. The two pilots had ejected safely. An advanced jet trainer aircraft of the Air Force crashed in a paddy field at Kudarsahi in Mayurbhanj district, leaving two pilots injured. The two pilots ejected themselves out of the aircraft before it crashed. The advanced jet trainer aircraft crashed after flying for about 50 km from the Kalaikunda Air Base on a routine sortie, Air Force officials said. An Indian Air Force Sukhoi Su-30MKI went missing while on training mission near Tezpur, Assam. The aircraft’s wreckage was found three days later along with the blackbox. Both the pilots, Ft. Lt. Achudev and Sqn. Ld. D Pankaj were killed as they were unable to eject before the crash. The Air Officer Commanding of the Indian Air Force station in Gujarat’s Jamnagar was killed in a fighter plane crashin the northwestern region. The Jaguar fighter took off from Jamnagar and crashed soon after in the Mundra taluk of Kutch district. Air Commodore Sanjai Chauhan suffered fatal injuries. The flight was a routine sortie. On 8 May, a MiG- 27 aircraft had crashed at Tantipara near Alipurduar town in West Bengal following a technical problem, killing two civilians on the ground though the pilot ejected safely. A court of inquiry was ordered. One person was killed and three others injured when an IAF cargo helicopter caught fire while landing in Uttarakhand’s Kedarnath on 3 April, 2018. The Mi-17 helicopter reportedly caught fire after it hit an iron girder while it was attempting to land in a helipad near the Kedarnath temple. The chopper was carrying construction material from Guptakashi to Kedarnath and crashed landed just short of the helipad. All six IAF personnel on board were safe though the pilot sustained minor leg injuries.